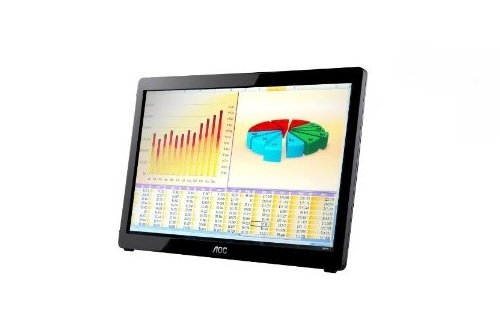 The 16" e1649Fwu USB Powered Monitor from AOC is ideal for presentations and dual monitor displays. No external power cord needed--it's all powered from a USB port in your PC or laptop. The 16" e1649Fwu USB Monitor is ultra slim and lightweight for maximum portability, with an attractive piano-black glossy bezel and a smart stand that allows for easy landscape or portrait viewing. Since it's USB-powered, there's no need for a for a power cord or VGA cable. The e1649Fwu is plug-and-play compatible with PC and Mac computers and laptops. It receives both power and signal via a single included USB cable for plug-and-play simplicity. This monitor offers a 500:1 contrast ratio, 5ms response time and 1366 x 786 resolution @60 Hz. The e1649Fwu USB Monitor is compatible with PC as well as Mac using the DisplayLink driver. It's ultra lightweight for greater portability, making it perfect for business presentations, the frequent traveler, photo frame applications, and dual monitor setups on-the-go. Price: $93.99 & eligible for FREE Super Saver Shipping.